The first post on the forum of CDS in 2014 was Victor Mornington’s announcement that Linden Lab had added his Tuscan Order building in Locus Amoenus to the Destination Guide for the next few weeks. The second post was a request from the Scientific Council to the Representative Assembly concerning two issues. Firstly, the SC asked the RA to consider making a new law to address the filling of vacant seats on the RA in a more timely fashion. Such replacements could be made by automatic appointment of a candidate from the previous election cycle, based on the voting in that election, or by specifying shorter time frames for the by-election cycle. Secondly, the SC requested that the RA consider contracting a qualified editor to review all CDS laws and the Constitution in order to identify contradictory language, and to review past RA transcripts to ensure that all laws are accurately recorded on the laws page of the portal. The third post of 2014 was an invitation from Tor Karlsvalt, on behalf of Widget Whiteberry and the people of Virtually Speaking, to a concert by acoustic guitarist and songwriter Reggiesunset at the newly renovated Colonia Nova theater. The first RA meeting of the year was held on 4 January 2014 (here are the agenda, transcript and minutes. The meeting began by approving an amendment to the previous Minutes, in order to correct the wording of the motion that had been passed about the new covenants for Locus Amoenus. 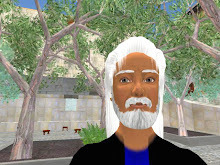 Callipygian Christensen, acting as a private citizen, then initiated a discussion of an incident in which a member of the RA had rezzed religious items on public land in CDS, and then ignored the Chancellor’s request to remove them. Callipygian wanted the RA to communicate to Chancellor Bagheera Kristan its support of expedient action in such cases, and that all RA members should confirm their oath to uphold the laws of CDS. From the subsequent discussion it seems that Cleopatra Xigalia had rezzed a nativity scene on public land next to her house on the Monastery sim, as a Christmas decoration, initially with the Chancellor’s approval. But when requested to remove it (public land in CDS should remain religiously neutral), she was no longer in-world. The discussion dragged on, but no specific motion was ever seconded. Next Callipygian, acting this time as Dean of the Scientific Council presented the requests the SC had posted to the attention of the RA. Discussion began on the request that the RA consider paying a qualified person a real-life rate to review the CDS laws and to make sure that they reflect all legislative decisions as recorded in the RA transcripts (the journals of the 11th, 13th, 14th, 17th and 19th RA are incomplete). Cleopatra suggested that a Request for Proposals (RFP) be put out to all citizens. Tor noted that the problem was partly due to the current lack of an RA Archivist, which was traditionally a paid position (at SL rates). Delia Lake estimated that updating the laws would take someone at least a month. It was suggested that Delia write the specifications for the job (the RFP), but she thought she would only have time to review specifications written by someone else. Cleopatra offered to write them. A motion was made to request Cleopatra to draft an RFP based on the required content identified by Delia, and to post it to the forum for review prior to the next meeting. The motion carried, and the meeting was adjourned until the next week. The next meeting of the RA was only a week later, on 11 January 2014 (agenda, transcript, minutes). The first item of Old Business was an update about the Chancellor and the Guild working together on the remodeling of the Locus Amoenus sim. Shep Titian as Leader of the Representative Assembly (LRA) read (or rather pasted) a statement from Chancellor Bagheera explaining that Locus Amoenus was back on track, and that either Rosie or Tor could share with the RA the collaborative spreadsheet used to figure out parcels and tier. But the RA would have to decide on the rates to be charged. Rosie Gray brought up an issue about parcels within Neufriestadt (somewhat off-topic) and again reminded the RA that the Guild has always had a working document about the parcels for the LA redo. Rosie also noted that the plan would only require moving 2 residents who have items on the ground. Next item of Old Business was the review and updating the of RA laws. Cleopatra had been charged with drafting a Request for Proposals to have this work done for a real-life fee. But Rose Springvale had posted on the forum that she was willing to do this work for no charge. Tor Karlsvalt motioned that the RA stop its efforts to find an editor for CDS laws, and accept Rose Springvale as the by-law editor. The motion carried. Under New Business came a discussion of the other request that the SC had made to the RA, concerning a procedure to fill vacant seats on RA, that would be quicker than the current by-election process. Gwyneth Llewelyn had suggested on the forum that the old “faction” (party) system be revived, in which case resigning RA members would be replaced by the highest-ranking candidates of that faction in the previous elections. Tos stated that he was against reviving the factions, but that he liked the idea of naming alternate RA members from among the candidates of the most recent election. Soro Dagostino observed that the new voting system with ranking points to the next candidate as a matter of math. But Callipygian added that the system also needs to address the times when there is no next candidate in line. And Shep thought that for only one vacancy a simple one-vote-per-citizen election would work. Finally Soro stated that an alternative could be appointment by the RA, in the case where there is no runner-up. A motion was made that the by-election discussion be moved to the forum for a period of 2 weeks, and the a commission be struck to hold a meeting in-world to discuss it. This carried. Tor brought up the Commission formed to study the Grievance Procedures that had been proposed by Cadence Theas. He reported that Lam Erin had some modifications to add, and hoped that the commission would have something available for public review by the next RA meeting. Following the 11 January RA meeting, Shep re-launched the by-election issue by re-posting it to the forum. Also, Chancellor Bagheera replied to the criticism of her "slowness" in responding to complaints. And various challenges to the Locus Amoenus update were posted, by Cleopatra and Abby Rose. On 13 January Callipygian acting as Dean of the SC announced a strange Forum Moderation Decision, concerning a forum post dated 12 December, and flagged on 23 December as off-topic, slanderous, libelous and overly inflammatory. The writer of the flagged post received a warning to refrain in future from referring to people's Real Life activities and relationships, and to post only provable facts, or personal opinions stated clearly as such. But I was unable to find the flagged post anywhere, and so I can report little more about it. There followed a series of posts invoking CDS history. A mysterious “lady observer” posted a curious, rambling text in praise of CDS, which brought tears to Cleopatra’s eyes. Then I announced that I was reviving my CDS Chronicles. This seems to have inspired Cadence Theas to propose a Collaborative CDS Oral History project. Forum discussions continued about Locus Amoenus. On 15 January Rosie Gray posted a reminder that the planning regarding redevelopment of Locus Amoenus goes back a couple of years. Bagheera held a Chancellor's Town Hall Meeting on 17 January to discuss the work on Locus Amoenus. And Vic Mornington announced that he and Lia Venra had decided to put the Tuscan Order building to use as a restaurant, since it was in the SL destination guide. On another note, Bagheera reported that a Japanese crew from SLTV had shot a live hour-long broadcast featuring CDS (the video can be seen here). Bagheera also posted a proposed budget for the 20th Term. This budget involved a global deficit, since the projected monthly revenues were less than the Linden tier, Bagheera she said she was optimistic that reopening of Locus Amoenus would solidify the recent upswing in positive cash flow. Cleopatra reacted to the budget by congratulating everyone for the increase in revenue monthly in December of almost $200 US dollars. Cleo than asking a series of detailed questions about the revenue situation. Patroklus Murakami introduced two discussion topics. The first concerned a possible procedure for recall of RA Members empowering voters to remove RA members from office if they prove to be regularly absent or behave badly. The second concerned reforming Land Sales to prevent citizens from buying up plots of land whenever they become free, and then control who purchases them by only selling them to their friends and supporters. Another RA meeting was held on 25 January 2014 (here are the agenda, transcript and minutes). The first item of Old Business was again the Chancellor and Guild working together on Locus Amoenus. Bagheera reported that there was an agreement that she would finish the parceling and the Guild would be on board for the actual doing. She presented the suggested parcel map and revenue report. If rent is paid on 80% of the private parcels, that would cover the Linden tier. Those present discussed items such as water parcels with houseboats, cliffs and beach, terraforming, an island, the fishing village, and how to sell the parcels once done – in particular, how to avoid taking parcels from current residents of the sim. It was suggested that Bagheera look at former Chancellor Jamie Palisades’s plan for selling parcels when LA opened the first time. She estimated that parceling and terraforming would take 3 to 4 days, and building 1 to 3 weeks. A motion was made to accept the Chancellor's plan for LA, including the parceling and terraforming, with the work to commence immediately. The motion carried. The next item was the need for a new by-election procedure. Callipygian had posted a proposed solution that involved performing a census every month so that by-elections could be held rapidly whenever needed. She offered to post on the forum some suggested wording for an actual motion, which could be placed on the next RA agenda. A motion was made to have discussion about by-elections moved to the forum, with the thread following Callipygian’s proposals, and to follow up at the next RA meeting. The motion carried. Under New Business, Chancellor Bagheera presented her proposed budget, as posted on the forum. Cleopatra asked questions, as she had done on the forum. From the ensuing discussion it appears that the income has improved over what it had been for a few years – as has the real world economy. It also seems that the advertising (promotion) funds come from reserves rather than from the operating budget. A motion was made to approve Bagheera’s budget, and this carried. Callipygian noted that financial statements on a monthly basis can be found here. The meeting was adjourned. Callipygian as Dean convoked an Ordinary meeting of the Scientific Committee for 28 January. But it seems the transcript was posted in February, so I may cover it in the next post. Concerning Locus Amoenus, Bagheera observed that within the Temple in the river (called Umbiliculus Mundi) is a time capsule, into which CDS citizens put personal momentos in 2008. (Danton was there!) She asked what should be done with it.